We could have gone either way here  Munchkins or flying monkeys. It was a close one, but sometimes you gotta pick the favorite. 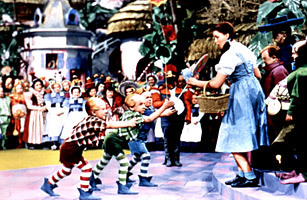 In 1939's The Wizard of Oz, one of the most beloved American movies of all time, the Munchkins are the denizens of Munchkinland (naturally), where Dorothy and Toto begin their journey following the yellow brick road. And while the Munchkins only appear in the film for a relatively small amount of time, they make such an impression that they are forever etched onto our collective imagination.